Property is dated & the beach is non-existent. The staff is not empowered to make any decisions or resolve any issues. Orbitz lists the room with a "view" (listing has now been changed) when the only view was of a parking lot. Had to pay an additional $20/day (originally $30/day) to get the room expected. Must also pay an additional $20/day for an amenity fee whether you use any amenities or not. Wifi is part of the amenity fee despite being listed as "free". Add another $9 per day for parking. We could've stayed at a much nicer hotel at the price paid once the additional charges were added on. We will avoid all Aston hotels for all travels in the future. We really liked the location, free towels and free DVD rental system. The Maui Jim scuba lesson offering was incredible and the best deal in Maui! The hotel itself was clean and the jungle pool was awesome. Our room (344) was pretty poor quality with dumpy appliances (super noisy dishwasher & and ice maker). It was a nice perk having W & D! The popcorn ceilings and Spectrum cable setup pretty poor quality. The fixes and details in bathroom were also pretty poor. The front desk did offer to upgrade our room based on our complaints, but unfortunately we didn't get message until day 5 of a 7-day trip. Not worth almost $300/night! We absolutely loved our view from our room! The two bedroom was very comfortable and spacious. The pool was a lot of fun for my kids. There were fountains and waterfalls. It was lighter decoratively at night. The garden area around the pool was so pretty with lots of greenery and koi pond. The beach here is not a swimming beach which was kind of disappointing. Very little sand and LOTS of rocks. The staff were wonderful. Very friendly and helpful. Having a full kitchen was great. Nice and clean, but definitely dated. The service people were very polite and on the ball. Activities and things to do all the time. Well manicured property. One of the best vacations I've ever had. Excellent location... Price right... Staff were A1. Amazing people excellent facilities. In house Expedia sight seeing guides. Pools and ocean views amazing. It took quite awhile for them to get our room ready for us to check in. We tried getting a room at 4:00 pm. The poolside restaurant service was very slow in the morning - 9:00 am the bathrooms need to be updated. Great property, lots to do and super nice staff rooms are clean and roomy. This our 4th time here and we will be back next year. difficult to turn shower on bcz of the knob. walls are too thin-can hear neighbors talking through walls. I killed a cockroach in the kitchen. I'm assuming upgraded rooms dont have these problems. Very pleasant staff. A friendly relaxed environment. Good value for the price . Aston Kaanapali Shores places you within 3 miles (5 km) of popular attractions like Kaanapali Beach and Whalers Village. This 463-room, 3.5-star condo resort has conveniences like an outdoor pool, free in-room WiFi, and a fitness center. In addition to a meal at the onsite restaurant, you can also enjoy a drink at the bar/lounge. For a nice break, mingle with other guests at the free manager's reception. Each condo is air-conditioned and has an array of amenities, including a microwave, a refrigerator, and a dishwasher. Guests can enjoy cable TV and stay connected with free WiFi. The bathroom offers hair dryers and free toiletries. Other standard amenities include an oven, a stovetop, and a rice cooker. 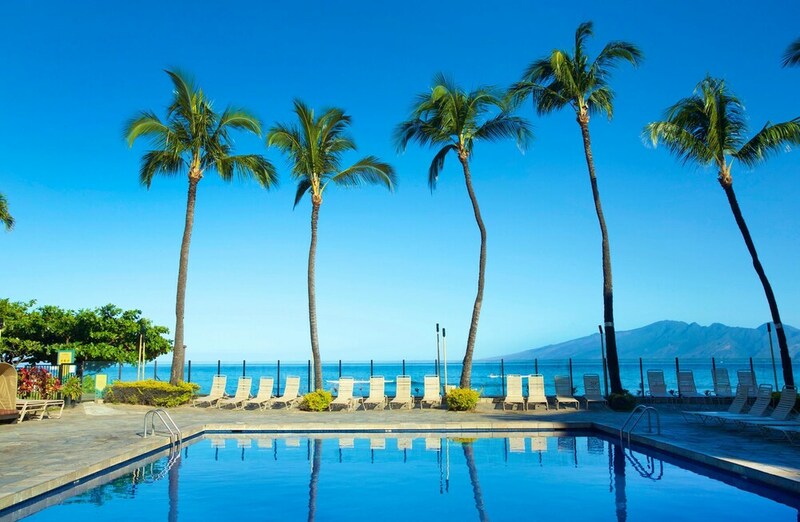 At Aston Kaanapali Shores, guests enjoy an outdoor pool, a fitness center, and a spa tub. Self parking is available for USD 9 per day. The 24-hour front desk has staff standing by to help with dry cleaning or laundry, and answer any questions about the accommodations. Other amenities at this beach condominium resort include a sauna, free WiFi in public areas, and conference space. Aloha! We appreciate the time you took to share a review, and are so glad to hear that you enjoyed your stay. We appreciate your feedback as well and we're sorry to hear that you weren't happy with your garden view accommodations. We would love to welcome you again in the future should your travel plans bring you back to Maui. Mahalo. Aloha! Thank you very much for your 5-star review. We are so glad you enjoyed a wonderful stay overall, and had a wonderful vacation experience. It would be our pleasure to welcome you again in the future! Mahalo. Aloha! Thank you very much for your 5-star review. We are so glad you enjoyed a wonderful stay overall, and had a wonderful vacation experience. Our daily parking charge and resort fee are listed on all of our travel partner websites and our resort website as well. It would be our pleasure to welcome you again in the future! Mahalo. Aloha! We are so glad you enjoyed your vacation stay, and were comfortable in your accommodations as well as appreciated our beautiful and ideal location. We hope to welcome you again in the future on your next Hawaii vacation. Mahalo, and a hui hou (until next time). Aloha! Thank you for a wonderful review. We are thrilled to hear that you loved every aspect of your stay, and that our staff, accommodations, entertainment, location, and dining all enhanced the quality of your vacation. We hope to welcome you again soon! Mahalo. Aloha! We appreciate the time you took to share a review, and are so glad to hear that you enjoyed your stay. We appreciate your feedback as well, and would love to welcome you again in the future! Mahalo. The condo resort has an outdoor pool and a spa tub. A sauna and a fitness center are other recreation options. The preferred airport is Kapalua, HI (JHM-West Maui).